VxRx is the shortened name for Vidinė Ramybė – probably a good thing for me because of all the accents, and I’ll keep it that way throughout this review. Likewise, HSSK is Hassockk, another moniker from the man who brings you the power electronics project Body Cargo. On the split Vilnius, VxRx cranks out the heavy PE stuff over multiple tracks while HSSK brings one 15 minute side of droning harsh noise and samples. The first couple of tracks from VxRx are pretty standard power electronics; opener “Karoliniškės: Naminių Gyvūnėlių Kapinės” churns away with some vibrating drones and a couple of static swashes while the artist yells his vocals overtop. Thankfully, this release from Terror includes a pull out lyrics sheet; unfortunately, I don’t read Lithuanian. Either way, it seems VxRx has a lot to say, and the powerful nature of his vocals adds an extra depth to even the more generic PE tracks. But the last two tracks from VxRx are slightly different from the rest – “Markučiai: Myžalai Bendrabučio Lifte” has a slowed tempo to it, warped and whirred so that everything feels ill-paced, while “Krasnūcha: Sunaikinti Pietų Vilnių” does a similar effect with one strand of sound that is perpetually pitch-shifted. HSSK’s one long track is much more blurry than VxRx’s offering, and lower in fidelity than normal with his Body Cargo work. Static, wind-swept bursts, and buzzing accompanies the track’s repetitive synth chords. Later on, as HSSK moves the territory from synth to vocal manipulation with a couple of samples, the subtleties of the track’s underlying sound emerge. The murky nature of the recording works well to mask things at first until sounds can emerge. Two heavy sides from these power electronics aficionados, Vilnius is worth your time because it’s not deeply rooted in generic sound. The tracks offered here aren’t what you might expect from something labeled PE, and that’s a great thing. 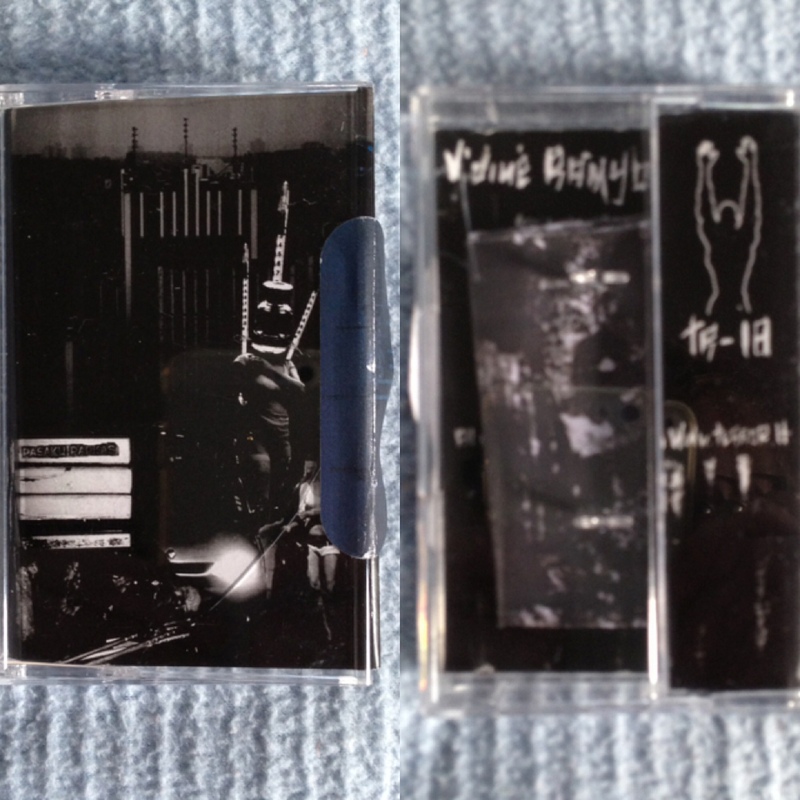 Add to it great packaging from Terror and you’ve got yourself a tape you need to seek out.